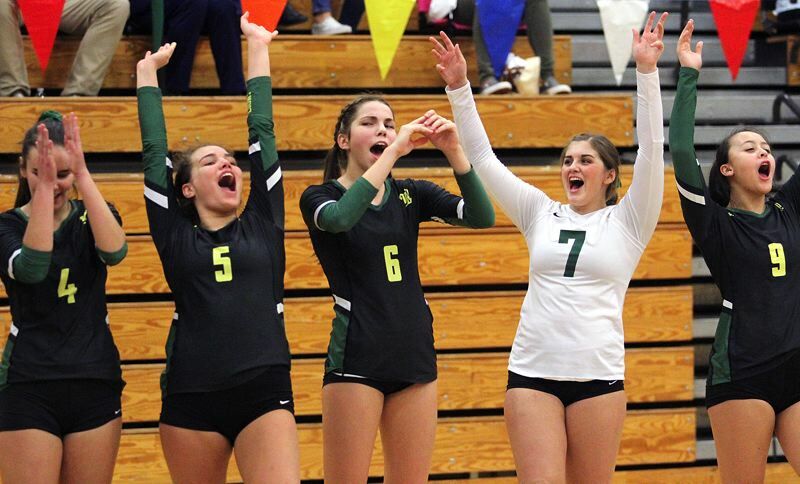 The West Linn volleyball team had seen both the highs and the lows on the first day of the Class 6A state tournament. The Lions opened with a 3-1 win over Sheldon in their Friday quarterfinal, but then got swept aside by eventual state champion Jesuit in their Friday night semifinal. Coming back for the final day of the eight-team tournament at Liberty High School on Saturday, West Linn decided it would rather go out on another "up." The fourth-seeded Lions did just that, sweeping past No. 7 Summit 25-23, 25-21, 25-15 to finish third for the second straight season, this time under first-year head coach Michelle Hoover. "At the very beginning of the season, we set goals as a team and our last goal was to finish top three at state," said senior libero Ellie Snook, the two-time Three Rivers League Player of the Year and a first-team all-tournament selection. "Re-creating the feeling of placing third at the state tournament was something that was so important to all of the returning players." "The biggest goal for the team this year was to finish in the top three in state," agreed senior defensive specialist Ellie Naone. "Everything we did from the start of fall camp and all of the work we put into this season was to make sure that we achieved that goal." With their success at the state tournament, West Linn finished its 2018 campaign with a 22-6 overall record after going 14-0 to win the TRL title. For West Linn's seniors, their four-year careers saw the Lions' varsity team win three TRL titles, post a combined Three Rivers record of 57-5 and a combined overall record of 88-22. In the first set against Summit, the Storm was still ahead 16-15 when a service error opened the door for the Lions. From there, sophomore middle blocker Makayla Long made a block to give her team an 18-15 lead, Kayla Moss had a key dig at 19-18 and the Lions ran off four more points behind the serving of senior Hannah Hashbarger, including two aces that put the Lions ahead 23-18. After three errors, the Lions finished off the set with another dig by Moss and a kill by senior middle blocker Erika Isaacson. While the Lions won the second set just 25-21, they led 22-13 before allowing Summit to close the gap. "We were in control of the match the entire way," Hoover said. "Great passing allowed us to set the middles, and big kills by Long and Isaacson kept us going." Tough serving and defense by Naone set the tone in the second set, Matthiessen had a key kill behind the defense of Wilmes, and Wilmes then had a booming kill to finish off the set. In the third set, the Storm hung with West Linn early, tied with the Lions 9-9 before sophomore setter Kate Griffin served her team to a 15-10 lead. From there, Snook made two key digs, Long and senior outside hitter Isabell Forster had a big block at 18-11, Isaacson notched a kill for the Lions' 23rd point, and digs by Snook and Wilmes ended it, with Wilmes' last save going over the net and hitting the floor to end the match. "For each one of us, being able to walk away from the tournament holding the third-place trophy meant everything to us," Naone said. "We were so proud of each other and of everything that the team was able to accomplish this season." "Going into the match against Summit, we all knew that it was our last time taking the court together and we knew we wanted to end our season on a good note," Snook said. "There's no reason to not give the last game of your season everything you've got and that's exactly what our team did." Snook was named to the all-tournament first team and Wilmes to the all-tourney second team.